Let's pretend, shall we, that I knew what I was doing, so I used my nice pretty red frying pans instead of my old icky ones. I always use my old icky one for experiments because if they don't go well, I won't feel badly about ruining the nice pretty red ones. But, the potato croquette experiment was a success! Next time, we're going to try some with sweet potato too. The kids & Shaun had some immediately, then F&B each had one cool later. They are apparently still good cold. They also were quite the darling preschool snack for Mr. Ben, just topped with a cute cheesy decoration. Don't forget, the Easy Lunchbox Giveaway closes Sunday!!! Adding this post to Food Revolution Friday, definitely enjoying the reads on there, lots of food for thought, no pun intended! looks yummy! I'll have to try these. Thanks for sharing! Thanks for the full recipe. They looked SO GOOD in the bento!!! These look delicious!!!! I can't wait to try and make them for the kiddos! By the way, do you think there is something I can substitute to take the milk/cheese out of it and still make it yummy? The cheese was just for flavor (whereas the egg held it all together and I don't know how to switch that), so I'd add a little extra garlic, onion, maybe even some Italian seasoning. We're going to make them with sweet potato too, so I'll be interested to see the difference in flavor. 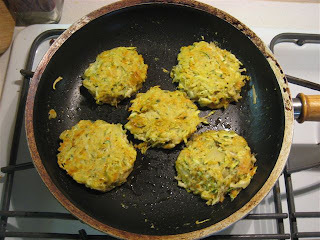 You said in the previous post that you were looking for the perfect sauce to go with the potato pancakes (what we call them in my house). Traditionally, they are often served in German households with applesauce, so you may want to try that.